Last week the next version of Office 365 was released by way of a public preview. This launch took place with little fanfare as all the attention seemed to be on the new Office 2013 suite. But the next versions of Lync, Exchange and Sharepoint are now all available as a part of the Enterprise experience of Office 2013 and of course the back-end Office 365 products. If you wish to sign up for a preview go here: http://www.microsoft.com/office/preview/en/try-office-preview . I thought it would be timely to repeat some of the information gained over the past few months, recycle if you will, some key articles that will guide you with a move to the new platform. As with any tenant to tenant migration of Office 365, there are certain steps you need to perform in order to move your domain across. As stated previously you need access to your DNS records and some knowledge of how that relates to your user accounts. I suggest you start here: http://itprofessional.co.nz/2012/03/07/migration-from-p-to-e/ Although this article speaks about a migration from the P plans of Office 365 (Small Business) to the E plan (Enterprise), the principals are the same when it comes to moving from Office 365 (current version) to the recently released Office 365 preview (Wave 15). In addition to this, the final step is “releasing” or removing your domain from the old tenant, allowing you to associate it to the new tenant of Office 365. Your domain can only be associated with one tenant at any one time, so this step is critical in your migration. 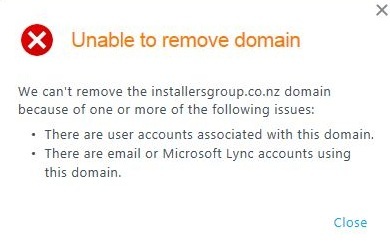 You will receive an error if you havent followed the correct steps first, removing all references to the domain from your current Office 365 tenant. For a more detailed step by step guide on how to remove or dis-associate a domain from your Office 365 tenant go here: http://www.configureoffice365.com/remove-office-365-domain/. The new version of Office 365 is due to be released later this year and customers can sign up for the beta on a 9 month free trial for 25 seats. So if you are at the bleeding edge of technology adoption I suggest you make the move and discover what the next version of Office has to offer. This entry was posted on July 28, 2012, 11:11 am and is filed under Cloud, Office365. You can follow any responses to this entry through RSS 2.0. Responses are currently closed, but you can trackback from your own site.